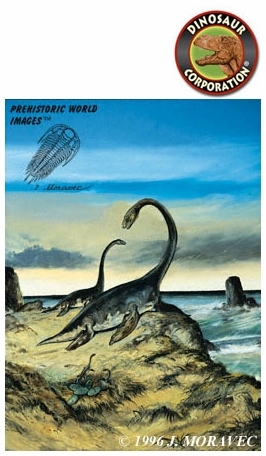 Home | DINOSAUR PAINTINGS | Plesiosaurus brachypterygius | Plesiosaurus, Art Picture, 13" x 19"
Plesiosaurus brachypterygius - Art Picture 13" x 19"
Plesiosaurus brachypterygius. Jurassic marine reptile from Jurassic period. Printed on premium photo quality super "B" paper 13" x 19". Original oil painting 24" x 18" by paleoartist Josef Moravec. Note: Watermarks and Copyright markings do not appear on the final photo quality prints. ▪ Plesiosaurus, Jurassic Reptile, Framed 14"x17"